The last we saw Rush Clovis, Padme’s former lover and fellow senator, Anakin had left him to die at the hands of Lott Dod, after Clovis’ betrayal had contributed to the events that nearly led to his secret wife’s death. 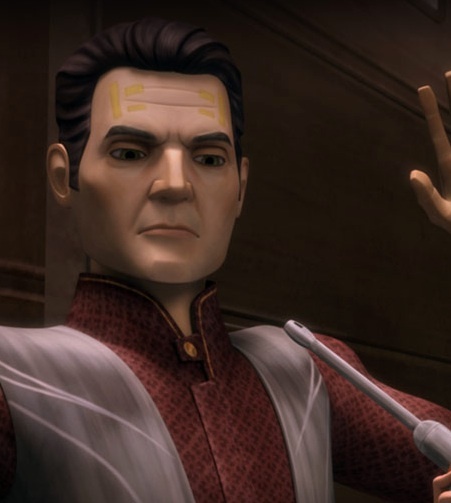 In the first arc I’m covering in this post (eps 6.5-6.7), we learn that he had managed to survive and is now a delegate for the Banking Clan. Once again here, he enlists Padme’s help in doing some espionage work in an attempt to expose corruption, and nearly gets her in trouble. And once again, over the course of the episode, he makes some very bad decisions. This time, however, he is being explicitly manipulated by both Palpatine and Dooku, both playing their incredibly complex game, which eventually ends up with Palpatine in control of the banks and Clovis dead, branded a traitor to the Republic. These aren’t the best episodes of Clone Wars ever, in large part due to the plot’s points being a bit repetitive and possibly unnecessary. While on the one hand, it is fascinating to watch Palpatine play his masterful, strategic game, and ruin lives in the process, it’s nothing that we haven’t seen from him before, so in some ways, it feels more like these episodes are reiterating things we already knew rather than telling a new chapter to the saga that had to be told. Furthermore, I’m not sure if anything substantial was really added to Clovis’ character by bringing him back here. Just as last time, he is a well-intentioned man still in love with Padme who, partly due to his own shortsightedness and partially due to outward forces he can’t control, screws up on an increasingly massive scale. That isn’t to say that these episodes don’t have their merit, however. In addition to witnessing the complexities of the plans within plans unfold, it also is an intriguing opportunity to examine the cracks in Padme and Anakin’s relationship. As with last time, Anakin is once again extremely jealous of Clovis, but here, it nearly leads to far more significant issues that threaten to end his marriage to Padme. And although Anakin might otherwise solely blame Clovis, Padme is clear in laying the entirety of the blame on the secrets they are forced to keep, due to who they are. Clovis wouldn’t think that Padme was a potential romantic option if she were able to be public about her marriage to Anakin. At the very least, it’s unfair to blame him for continuing to pursue her, given he doesn’t know that she is married. More than any other previous Clone Wars arc that I can recall, this story truly demonstrates the significant strain that Anakin and Padme’s lies have placed upon them. At times in the past, it has felt dangerous, romantic, and exciting, but there is a dark underside to that, and that toll is really felt in these episodes. And this is of crucial importance, because in the end, it will be their marriage and their secret-keeping that puts the final nail in the coffin of the Republic. In addition to Clovis’ death, this arc also includes the death of Padme’s beloved handmaiden, Teckla Minnau, particularly sad since, in the past, she is the one who spoke to Padme about how the everyday people on Naboo were faring, a conversation that helped Padme in an important blow against Palpatine’s plans. Her death here is indicative of the fact that we are now getting past the point that any such small victories can occur again. Meanwhile, the second arc–eps 8-9–is disappointingly meh. It involves Jar Jar Binks and Mace Windu of all people teaming up to discover why powerful Force users on a planet are mysteriously disappearing, the reveal being that the powerful Nightsister, Mother Talzin is trying to remanifest by somehow sucking the Living Force out of these people in order to strengthen herself and while it has some thrilling moments, it never really justifies its existence. For one, Mother Talzin’s return and her undoing soon thereafter are surprisingly anti-climactic, failing to live up to the epically awesome, theatrical evil that she was known for in the past. In the end, the mystery reveal is rather uninspired and too swiftly resolved, and the romantic (erm) relationship between Jar Jar and the queen, Julia, who enlists his help feels underdeveloped, not that I necessarily would have wanted more of that. For what it’s worth, Jar Jar and Mace are mostly entertaining to watch together. They are such an odd, unlikely pairing that watching them chafe against each other provides for some terrific comedy, and let’s face, more Master Windu–at least on Clone Wars–is always a good thing. As with some of the season 5 arcs, though, it does seem a bit of a shame that some of the last episodes of the series were taken up with this more disposable storytelling, and that some of these “lost” episodes haven’t been on the same level as the aired ones. I’m sure, had they known about the cancelation in advance, that they would have focused on more worthy stories.